So, you've decided you're going to stop buying all that bottled water, and get your clean water straight from the tap by using a reverse osmosis water filter system. How do you pick the right one? How do they work? Do you need a 5 stage reverse osmosis water filter system, or 7 stages? Before you can choose the best reverse osmosis water filter system for your home, you'll need to know how it works, so you can choose among all those 5-stage and 7-stage options to get down to just what you need. That's what I hope you'll understand by the end of this article. I'll describe “osmosis” and the several stages in a complete filtering system. Simply. Why these things are great, and why you might want to reconsider. An overview of the things you'll need to consider when purchasing. A list of a few good brands and stores. There seem to be a lot of technical considerations, but I'll do my best to make it as simple as possible, and easy to understand. At the end of the article, I'll list a few recommendations for some good RO systems, with links to places to buy them, to get you started on your search. *I'm going to assume that you've already done your research about the impurities in your tap water, and have decided that they are not worth drinking regularly and long-term. So, I'll be focusing on HOW an RO system will rid you of these impurities, rather than on whether or not you should remove them in the first place. Let's get right into it: What is a reverse osmosis water filter system? How does it work? First I'll explain Osmosis in the simplest way you've ever seen, and how reversing it gives you extra clean water. Then, I'm going to talk to you about all those “Stages” in reverse osmosis water filtering systems — why they're all necessary (or not), and what each one means for you. Ok, let's start with “The Membrane”: It's a thin sheet of material with tiny holes that only small molecules like water (H2O) can pass through. Stuff made up of larger molecules — such as salts, metals like lead, chemicals like fluoride, some bacteria, and junk like that — can't pass through this Membrane. 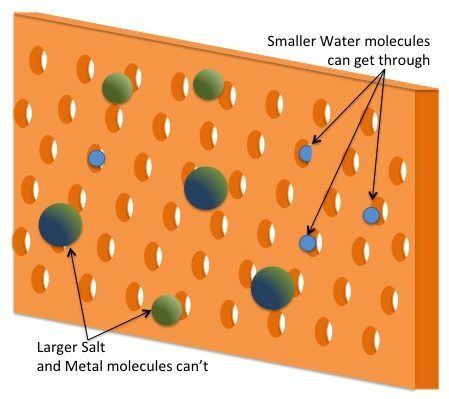 The Reverse Osmosis Membrane only allows certain sized molecules through. So we have water with a high concentration of junk on one side, and a low concentration of junk on the other. Through Osmosis, the water will naturally flow toward the higher concentration to achieve equal concentration on both sides. It's Nature's way of achieving “balance”. In this case, that means equally dirty water on both sides. We don't want that. We want cleaner water! Let's reverse the process. Applying pressure to the side with higher concentration will reverse the flow of water molecules. Now we have significantly cleaner water on one side, and some junk to get rid of on the other side. But this is only ONE part of the entire reverse osmosis water filtration system. The Membrane is actually too delicate to all the work by itself. So, there are other important Stages in the process. If you've done any searching around, you've seen anywhere from 3 to 5 stage reverse osmosis water filter systems available. Recently, I've seen as many as 7 stages in some of the top-rated reverse osmosis systems. What the heck are all these stages, and what do they do? First, you'll have one or more Pre-Filtration stages, to get rid of the larger particles that could damage your reverse osmosis filter. Things like rust, dirt, and certain chemicals. Next comes the Reverse Osmosis stage, which is the heart of the system. It's simply the reverse osmosis filter I described above, removing salts, metals like lead, chemicals like fluoride, some bacteria, etc. 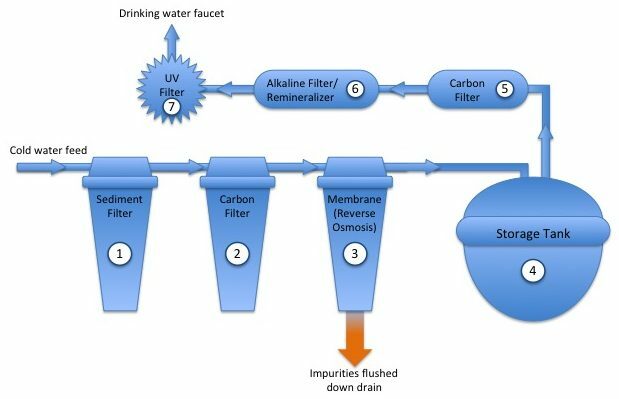 Finally, during the Post-Filtration stages, a number of filters or processes are used to clean out anything that was missed by the reverse osmosis filter. Some of these stages will even add back stuff that you may have wanted to keep in the water, like healthy minerals. “Waitaminit! You said THREE categories!” Yeah, I know, but I really wanted to make this stand out. While it's not really one of the “filtering” stages in the system, the Storage Tank is where all the clean water is stored before coming out of your spout. And if you don't take it's size into consideration, you're going to be disappointed when you try to install your system. 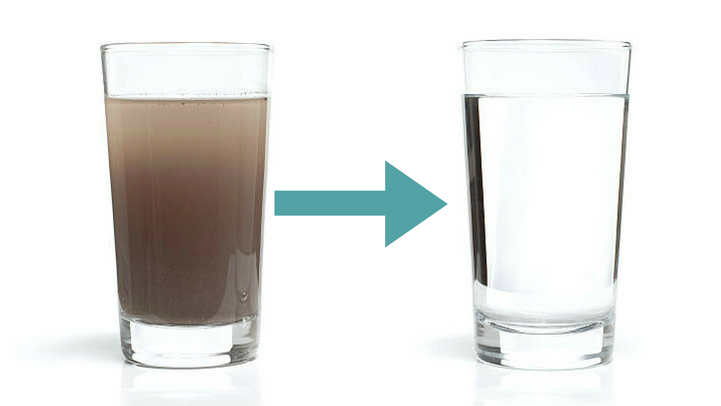 The filters in the first few stages remove impurities that could potentially damage the Reverse Osmosis filter. First, Sediment Filters remove the larger particles that might clog the Reverse Osmosis filter. Dirt, silt, rust, calcium carbonate, and other chunkier contaminants are separated by one (or sometimes two) of these filtration stages. 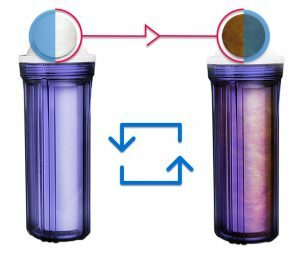 Next, Carbon Filters remove the chemical contaminants that can deteriorate and damage the Reverse Osmosis filter. Chlorine and chloramine (which are added to tap water to disinfect it), and other organic chemicals that affect the taste and odor of the water are removed in this stage. This is where the Reverse Osmosis Filter kicks in. We discussed this stage above. Even some of the minerals you may have wanted to keep in your water are mostly gone. The clean water moves on to the final stages, while the contaminants that were filtered out are flushed down the drain. At this point, what many of the multi-stage filtration systems do is add a few stages that will “polish up” the water for you. Many people consider these stages to be optional. But, depending on what you're trying to accomplish, some of these might be required steps. They will either remove the last little bits of chemicals and contaminants that may have made it through the first stages of filtration, or add a few things back in that you may not have wanted removed. Now that the water is mostly clear of contaminants, carbon filters can be more effective. Additional filters here can remove those chemicals that made it past the reverse osmosis membrane. Certain types of bacteria can make it past your reverse osmosis filter. These tiny microbes are then subjected to an ultraviolet light as a sterilizer. The light kills the bacteria, and renders them harmless. * I recommend doing your own research on the effects of alkaline water and the bioavailability of minerals before deciding upon either of these options. As I mentioned, this is where all your nice clean filtered water is stored before it's served up to you through the faucet/spout. The storage tank keeps the water at the ready, so that you don't have to wait too long to get a drink. The filtration process slows down the flow of water considerably. So much so that, without the Storage Tank, you'd be standing at your faucet impatiently watching water drip slowly into your glass. This tank is the largest single part of the reverse osmosis water filter system. With under sink reverse osmosis water filter systems, they can come as small as about 2 gallons (about the size of a basketball) or as large as 4 gallons. You can even replace them with larger tanks later if you need to. Even though the storage tank is usually pictured in the product photographs you'll find online, people tend to underestimate its size, or brush it off as a second thought. Make sure there is space under your sink for the tank when you purchase your system. While I've listed 7 possible stages above, and in 3 categories, the system you buy might use any combination of the above stages to clean your water. Carbon filters, for example, come in different grades to filter out different contaminants. A system might use two different types, and count each one as one stage. Be sure to read the product's details about the stages, to make sure they address your particular concerns about your drinking water. First, I'll give a quick list of the Pros right here. Then I'll spend a little more time on the Cons. 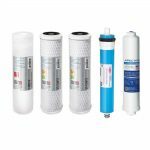 For people who want the cleanest possible water they can filter themselves, reverse osmosis water filter systems are an excellent option. Our water travels several miles on its way to our faucets, and it can pick up a lot of junk along its journey. Dirt and sediment, bacteria, rust and other metals, and maybe even some hormones, pesticides, or pharmaceutical drugs can get carried along the flow through the underground pipes, passages, and waterways that run through our cities, towns, and countrysides to our homes. Sometimes, stuff is purposefully added that's supposed to make the water better. Like chlorine and chlorides to kill the bacteria and germs, and fluoride to fight tooth decay. Many of us have reconsidered taking a lot of this stuff into our bodies. Installing a reverse osmosis water filter system at home gives you control over your water. Pure Drinking Water: You get desalinated water, free of pathogens, contaminants, debris, funky odors, and chemical tastes. Control: Choose a system that filters out what you want to remove. Convenient: Requires minimal maintenance, and you can have clean drinking water at the touch of a finger. Affordable: Can be cost effective compared to other pure-water systems like bottled water and water pitcher filters. Wait, so what about Bottled Water and Water Pitcher Filters? Bottled water is a popular and healthy option. Check the labels, and you'll find that many brands use reverse osmosis to provide the clean water! Those popular pitcher water filters are a great convenience, but they don't filter out everything you might want to remove from your tap water before drinking it. They are essentially just the “Pre-filtering” stage of a reverse osmosis system. They do get rid of much of the junk that you want to filter out. They also keep things like healthy minerals in the water, which is an advantage over RO systems. However, that also means that some things like bacteria and fluoride* will get through. *I'm not going to argue over the health benefits and risks of fluoride. Some people want it, some don't. I just want you to know which water filtering systems will filter it out, and which keep it in. After their initial excitement about reverse osmosis water filter systems being the savior of their tap water, many people make a few discoveries that give them pause. 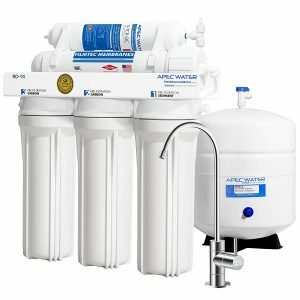 I want to clarify a few of the things you'll want to consider when deciding if a reverse osmosis water filter system is right for your home. The water flow will need to be split into two — part to your existing faucet, and part to your filtering system. You'll also need an additional hole in the drain, so that all the filtered impurities can be flushed down and out. Once installed, your system will take up a significant amount of space under your sink. As I mentioned before, the storage tank alone is at least the size of a basketball. Yes, you will need to replace your filters. Regularly. And, each stage of filters will have its own replacement schedule. Depending on how much filtered water you use, you will have to replace most of your filters every 6-12 months. The Reverse Osmosis stage of the filters usually lasts the longest, and only needs to be replaced every two years or so. However, you may have to replace it sooner if you don't replace the pre-filtering stage in time. Failing to replace the filters in time means they will let impurities through. And if certain impurities and chemicals like Chlorine get through the pre-filters, they can damage the Reverse Osmosis filter, which means the whole filtering system is pretty much ruined. It's your responsibility to make sure the filters are replaced regularly, and on time. Is it possible to clean TOO well? Isn't pure water what we want? The real question here is, what do you want to filter out of your water? Is your reverse osmosis filtering system rated to remove that stuff? Always check the documentation before purchasing one. You can usually find product manuals online. I always include links to these in my reviews. And, what about the good stuff like that minerals you want to keep in your water? As I've explained, many of those minerals do not make it through the cleaning process, which causes some people to dismiss the other benefits of reverse osmosis water filters. Take a look at those systems with those extra additive stages. You may decide that adding those minerals back in is worth having taken them out with all the other junk in the first place. For every gallon of purified water you get from your reverse osmosis water filter system, it will use an additional 1-3 gallons of water to flush out the junk it filters out down the drain. Most systems' documentation will provide you with the “Filtered Water to Waste Water Ratio” under ideal conditions to help you determine how your water usage will increase. *While it is possible to set up your system to service whole house, reverse osmosis water filter systems are most efficient for providing your drinking water. Considering that most Americans spend about $100 a year on bottled water (which would be $400/year for that family of 4), an RO system would save nearly $300/year. Also consider the convenience of having that clean water at the ready, literally “on tap”, and the time and resources you'll save in recycling PET bottles, and you can decide for yourself whether or not it's worth it. Determine what's in your water that you want to filter out. Test your well water, or contact local water authority. Make sure you choose a filtering system calibrated to removed those contaminants. Decide whether you want to remove minerals from your water, or keep them in. If you want to keep them in, you should either consider a system with additional stages that add minerals back into the filtered water, or a filtering method OTHER than reverse osmosis. Can you manage/afford the Maintenance…? Each of the filtering stages in your reverse osmosis water filter system has a different lifespan, and will have to be replaced on a regular basis. Check the manual and sales materials before you buy to determine how easy it is to swap these out, and be sure that your installation makes it easy to do so as well. Also, check on how frequently each filter needs to be replaced, and check prices for the replacements online, so you can set a schedule and a budget for yourself. Estimate how much clean water you'll need in a day. Most people will only use their filtered water for drinking and cooking. Others may want to use it for plants, or brushing their teeth, or more. This is also affected by the size of your household. Popular reverse osmosis systems for home use are rated in gallons per day (GPD). Usually they produce more than enough for an average household, but if you want to know more, check out the sidebar about Reverse Osmosis GPD, below. Where do you have room to store the filtration system? Under the sink? On the counter? In a separate, specially designated cabinet? Will it compete for space with your garbage disposal or other things in your cabinets? Again, check the manuals and sales material to estimate how much space you'll need for the filters—and don't forget to consider the storage tank's size! Will you need access to electricity? Basic systems only need water pressure to work properly. However, additional stages like an ultraviolet lamp or alkaline re-mineralizer might require an external electrical source nearby to plug into.If you have very low water pressure, you may need to plug in a permeate pump that will bring the water pressure up to a level that will work with the reverse osmosis membrane. Plumbing and Construction Work — What kind of alterations need to be made to your sink or plumbing? Will you need to split your water source and add extra piping? Do you need to drill an extra hole for a faucet for the filtered water, or can you feed your newly filtered water into your pre-existing faucet? Determine whether or not you can do the work yourself, or if you should pay someone like a professional or your savvy uncle. Will you need/want any Reverse Osmosis Accessories? When I say “reverse osmosis accessories” I don't mean the basic things you'll need for the system to provide you with clean water — like the faucet, or electrical outlets, plumbing, or anything else required for installation. Here. 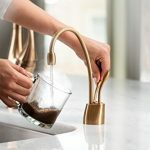 I'm talking about things that will enhance your experience.For example, while you'll need a basic faucet to pull clean water from the storage tank, you might opt for a hot and cold filtered water dispenser that will provide hot water on demand for tea, coffee, cleaning, or cooking. Or, if you want your filtered water to come out of the water dispenser in your refrigerator door, you might get a reverse osmosis refrigerator kit that will send the water to your fridge. 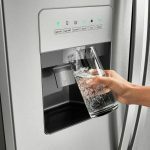 This will also provide clean filtered water to your ice-maker for ice.Water testing kits for drinking water are another popular accessory, as are pH balance testers for those looking at mineralized water. 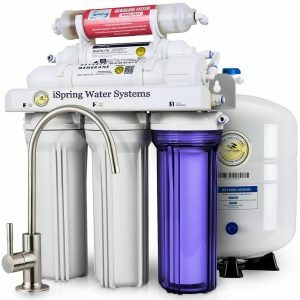 A reverse osmosis water filter system for home use is usually rated in GPD — gallons per day. This is knows as the Production Rate. Or, how fast clean filtered water is produced. Several factors actually affect the production: things such as water pressure, water temperature, the condition of the filters, the concentration of contaminants in the water, and so forth. The rating is more of an average of various situations. Many of the popular reverse osmosis units are rated to make as much as 50, 75, and even 90 gallons of water a day (approximately 2, 3, and 4 gallons-per-hour). Some will only make 25 or less. However, the cost difference between the various units often seems insignificant — or, it comes out to about the same. Why might you want to buy the lower producing RO unit? Reverse osmosis filtering systems clean themselves and their membranes as they process water. (Remember the example above?) So, the longer it takes to fill the tank, the less time it's sitting idle, and the more time it's being cleaned. This way, it's healthier for the membrane if it has to work longer to fill the tank. If you need 75 gallons a day, then buy the 75 GPD unit. But, if you're only going to use 5 gallons a day, a lower GPD membrane will probably last longer and do a better job in the long run. Whew! That's all the technical and shopping considerations. To those of you who have read all the way up to this point, thank you for sticking with me. Here are 3 models from three top brands that you can find in the $200~250 price range. I'm presenting models with different sets of options so you can see what's available. The “Superb Taste” of the iSpring RCC7AK comes from the 6th Stage alkaline filter, which adds back minerals that were removed during the reverse osmosis filtering process — including ionized calcium, magnesium, sodium, and potassium. Not only are they good for us, but these minerals account for what we associate with the “refreshing taste” of natural spring water. The re-addition of these minerals also adds 0.5 to 0.8 in pH to help offset the pH lost during the RO process. One cool feature of this model is the transparent blue casing for the 1st Stage filter. At a glance, you will be able to see whether or not it's time for a filter change — before any problems occur. This model is also considered “high capacity” — it boasts a 3.2 gallon storage tank which can be positioned vertically or horizontally for the best fit. It can be used with well-water sources, or heavily chlorinated municipal water, purifying up to 75 gallons of water per day, with a Waste Water Ratio of 1:3. *I've also seen a 1-year money back guarantee with a 3-year limited warranty listed on Amazon.com. Please confirm these details with your retailer upon purchasing. Filter replacements can be purchased individually by stage (click links above for prices on Amazon), or you can buy a 1-Year Replacement Pack or a 3-Year Replacement Pack at a savings. *For those of you with low water pressure (below 45 PSI), consider iSpring model RCC7P-AK — it comes with a pump to compensate for low pressure, and is available online from: Amazon • Home Depot • Walmart. APEC regards their standard-setting Ultimate RO-90 as their “Flagship” product, for its high production rate and high-capacity, long-lasting filters. This model also boats a high production rate of up to 90 GPD (gallons per day). Now, keep in mind that many factors affect this production rate. To APEC's credit, they are very transparent on their website about these factors — stating that, with source/feed water at 77°F, the filter will produce 90 GPD @ 60 psi, and 75 GPD @ 50 psi. It can be used with both well-water and city/municipal water sources, with well-water requiring more frequent changing of filters. The system comes standard with a 4-gallon storage tank which can be upgraded to 14 gallons (or even downgraded to 3 gallons). It also comes ready with a goose neck chrome faucet (or, brushed nickel for about $20 more), a complete set of filters, and a 1-year limited warranty. Filter replacements can be purchased individually by stage (click links above for prices on Amazon), or you can buy an Ultimate Complete Replacement Filter Set at discount. Here it is at Home Depot. Keep in mind that the filters change out at different intervals. So, while these “complete kits” give you all the filters you'll need, you'll need to replace the first 3 stages more frequently. Buying a set of the first 3 stages makes more sense. Aquasana's 4-Stages can be a little misleading — they actually combine filters in their stages in what they call their “Claryum Technology” to get the performance of a 5-6 stage filtering system. The advantage to this is a simpler maintenance system, thanks to fewer stages to replace. The OptimH2O includes an alkaline filter, which adds back calcium, magnesium and potassium for optimally alkaline, pH balanced water. The system works with well-water sources and municipal water, and will purify up to 35 gallons of water per day, with a Waste Water to Production Flow Ratio of 3-5:1, depending on water quality. This system also comes with a goose neck brushed nickel all-metal faucet, a complete set of filters, a 90-day guarantee, and a 2-year warranty. 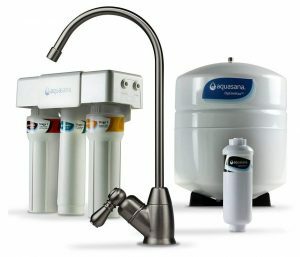 Aquasana filter replacements are a little more expensive than other brands. They can be purchased individually by stage, with the first and third stages usually coming together as a set (click links above for prices on Amazon). 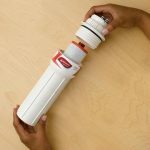 I've discussed a lot here about the general reverse osmosis water filter system: how it works, how to determine what you need and pick the right reverse osmosis water filters for home use in your situation. And, I've listed a few models you can look at to begin your search. How can I make this article better? Do you know of any systems you'd like to share with other readers? Do you still have questions that aren't answered above? Or, does the article inspire MORE questions? Please leave your questions and ideas in the comments section below. I look forward to hearing from you. Thank you for reading. I hope the information above is helpful.